When it comes to environmental impact, we all have choices to make: use less water, recycle more, turn down the thermostat. But few choices are as consequential as the vehicles we choose to drive and how we drive them. Data published by the EPA indicates that the US transportation sector accounts for 27% of our national greenhouse gas emissions, with passenger cars and light-duty trucks acting as the single greatest contributor to the sector. With over 263 million registered vehicles on the road in this country, it is clear that America’s love affair with the automobile has a major impact on our environment. Not all communities have an equal effect on the environment, however. Some cities have an appreciably lower impact than others, based on their residents’ choice of vehicles and driving habits. So the data scientists at Insurify, a car insurance quotes comparison website, set out to determine which US cities are the greenest. After analyzing over 1.5MM auto insurance queries submitted through our car insurance comparison platform, Insurify identified and ranked the five communities in each state with the lowest average vehicular carbon footprint. 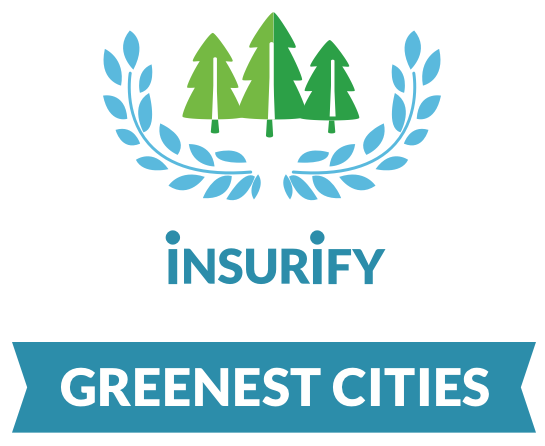 By plugging all of these factors into our algorithm, Insurify identified the greenest cities of 2018. Some winners already have a reputation for environmentalism, while others might surprise you, but we followed the data where it led us—an approach that rewards communities that actually impact the environment less, versus those that only preach green living. Compare the best auto insurance quotes comparison websites to get insurance quotes today. Read up on Insurify’s best car insurance companies of the year. Uber Insurance: Find providers that offer the best rideshare insurance coverage for Uber and Lyft. The General Auto Insurance: Get quotes from The General. Compare home insurance quotes from top companies today with these top-rated comparison sites.